Almost unnoticed, America’s literary culture seems to be in a quiet but consistent mini-spate of nostalgia for President John F. Kennedy (1917-1963). The 35th President served from 1961 to 1963 and his life - as even putative Mars dweller should know by now - ended with his assassination in Dallas on November 22, 1963. The recent popular culture outpouring is more sustained than dramatic but may point to some tremblers in the wider culture, especially in this election year. This is the argument made below. Stephen King, prolific author of fifty-four books that often make a stir, skillfully joined this Kennedy boomlet with an 842 page fictitious account of a time-travel attempt to save the president from assassination. It is titled, somewhat lugubriously, 11/22/63 and was nominated for the Los Angeles Times Book Prize for 2011. King’s latest effort underscores the never-failing interest in the Kennedy legend. The Democratic National Convention in September 2012, included a speech by President Kennedy’s daughter, Carolyn, and a fulsome tribute to the last Kennedy brother - Senator Ted Kennedy - played on CNN just before the gathering. In such ways and admittedly in a minor key, the Kennedy Dream endures but…so does the nightmare in Dallas. In his Afterword, Stephen King notes that the assassination in Dallas was his generation’s 9/11, but it is quite enough to say it was the baby boomers 11/22/63. While unabashed adulation for the slain President crested in the mid-1960s, this latest spate of interest is notable for its variety. President Kennedy’s association with actress Marilyn Monroe would guarantee a lively popular culture presence all by itself. Enter Keith Badman’s Marilyn Monroe: The Final Years in summer 2012 confirming that the blonde mega-star’s relationship with Bobby Kennedy was a no-starter and that with Jack was a one-night stand at Bing Crosby’s house! This, however, was known in the 1970s when the Kennedy Myth was beginning to get a bit tarnished. The gamut includes both sides of the political spectrum. MSNBC’s political pundit Chris Matthews’s admiring Jack Kennedy: Elusive Hero is counterpointed by Fox newscaster Bill O’Reilly’s insensitively titled Killing Kennedy: The End of Camelot. There is also the oblique but significant section on the Kennedy Presidency in historian Robert Caro’s fourth volume of his massive The Times of Lyndon Johnson. As explained to CNN journalist Fareed Zakaria on his “GPS” Sunday morning show, The Passage to Power includes how the Kennedy team callously mistreated Vice President Johnson, labeling him “Rufus Cornpone.” But Caro includes a chapter on the events in Dallas, told from the then-Vice President’s ringside view. The centerpiece here, however, must be 11/22/63, Stephen King’s rich, heartfelt and wide-ranging grab-bag of themes. The London Review of Books got most of them: a JFK assassination story, a story of time travel, a variation on a grail quest, a novel of voyeurism, a love story, a historical novel, a counter-factual history in fictional terms, and, not least, the chilling tale of a sinister animate universe reminiscent of the ghost stories of Henry James. King’s latest effort meets popular culture savant John Fiske’s definition of a successful pop culture artifact as a “broad text” - a wide-ranging link to several public sensors at once that transforms mass productions into cultural products. (For example, a hockey stick is just a piece of lumber unless signed by Wayne Gretzky.) In the view of The New York Times, those events in Dallas in November 1963 require “great brazenness to go anywhere near this subject matter.” The Kennedy Assassination is almost the Great White Whale at the conjunction between our popular and political culture. King courageously admits to NPR how he first thought of this theme in 1973 (when he taught school in Maine) but realized he needed years to do the research to make it work. Work it surely does. The overseas press was almost universally favorable and Jeff Greenfield of The Washington Post, a former Bobby Kennedy operative, praised the “prodigious research” involved and the novel’s anchoring in abundant realistic detail. The usual King emotional topography is in place. The action begins in Maine, the author’s epicenter of the universe. The hero is a teacher, another King touchstone, and he serves up a genre fest that is “staggeringly addictive” in the words of USA Today. The idiomatic-based dialogue rarely lets you down. The plot? Recently divorced Jake Epping teaches school in Lisbon Falls, Maine, a quiet town where he makes the acquaintance of two people who will drive the action forward. One is Al Templeton, the proprietor of a small diner who has the unusual practice of serving cheap hamburgers at 1950s prices. This is an early eerie tip from the King mind-meld that something odd this way comes. One can almost visualize the author’s smile as he sets this up. Al is a typical unforgettable King character, evocative of a creeped out Steve Buscemi in the movie Armageddon. He shows Jake how the pantry at the back of the diner is actually a time transport into the past - to be precise 1958. When you step in there - or out actually - it is always 11:58AM, September 9, 1958. When you return you are back in 2011 where only two minutes have elapsed. Al’s question is rhetorical. He has done his own prodigious research and is convinced that Kennedy would have pulled out of Vietnam and 95% sure that Lee Harvey Oswald acted alone on November 22, 1963. Therefore Oswald must be killed. Is Jake up to it? After a while, yes. But first he wants to have a trial run. Harry Denning, the school janitor, was injured by his maniacal father and his family killed by the same villain back in the 1950s. If Jake can successfully kill the perpetrator, then maybe Dallas is do-able. King obviously hasn’t lost his taste for the calculated grotesque, but hold on. A standard trope in time travel writing is The Butterfly Effect. This is the pseudo-scientific notion that a butterfly’s wings fluttering in Brazil cause tornadoes in Texas. In other words you can’t change the past without consequences. You cause a historical reset. King is building on Ray Bradbury’s 1953 short story “The Sound of Thunder” which has the same downbeat associated with time-travel: “Events can turn on a dime but the past is obdurate.” This formula keeps recurring in the novel. A dime indeed: George W. Bush won Florida by 537 votes in 2000! But in time travel lore, the past doesn’t like to be moneyed with. Thus the plot unfolds. Jake disappears in the pantry one more time and assumes another identity while living south of Fort Worth, Texas where the Oswalds will eventually set up housekeeping. He meets the school librarian named Sadie and falls in love. King's page-turning sense of pacing is never better than when Sadie and Jake have to get to the Texas School Book Depository on 11/22/63 before Oswald can do his thing. In spite of meticulous planning, all kinds of interventions occur to frustrate them in this attempt - car crashes, buses off kilter, Jake’s previous injuries. But they get there. Jake pulls if off. Oswald is killed and, in an exquisitely memorable moment of high fiction, both Jack and Jackie Kennedy phone him later that night even as he is trying with FBI help to get back to the pantry in Maine. He knows too much about secret service screw-ups to stay around. All in all it’s a terrific premise with a high suspense conclusion, “tight and energetic from start to finish” opined The New York Times. King’s love for American history and the accoutrements of American mass culture - from deliciously real 1958 ice cream to two-tone Plymouth Furies - are all there. But what might it all mean? And why just now is this bold fiction at the center of things Kennedy? National Public Radio calls King’s fictional retrospective his “most ambitious and accomplished” effort. First, the yearning sense of unfinished business that dogs the baby-boom generation over the abrupt curtailment of the Kennedy Presidency. Next, the pervasive sense of existential bewilderment that a small fry drifter such as Lee Harvey Oswald could erase an American Presdient. But then history does turns on a dime. Through Jake Epping, King does attempt a cursory reconstruction of the last thirty years - Kennedy could not get his civil rights legislation through Congress and the resulting race riots were so shattering as to bring George Wallace to power in 1968. Wallace and his Vice President, General Curtis Lemay, bomb Vietnam back to the Stone Age only to let the nuclear genie out of the bottle. This opens up a precedent for latent conflicts with India and Pakistan to coat the air with radioactive debris. The resulting disfigurement of much of the population is perhaps a doleful reminder of the failure of the Limited Nuclear Test Ban Treaty Kennedy and Khrushchev sealed in 1963. The “sinister animate universe” takes over, the past is obdurate and in King’s reconstruction of 1963 to 2011 things got worse overall. Worse for the planet and worse for the United States. No wonder King rushes through his angst-ridden alternative history. With the Kennedy legend we are in a realm where the popular and the political and the national cultures intersect mightily. Perhaps a mainstream historian can offer a plausible summing up. Aware of the flaws of the Warren Commission and its elite rush to judgment to exculpate the Soviets on 11/22/63, Paterson adds: “The assassination of JFK, in short, was not only an outrage by an unstable individual; it was also a politicized act, one of the most terrible in the history of the Cold War.” Here is an obvious but often ignored macro-setting for the events in Dallas. Kennedy’s bold overtures to the Soviet Union in his American University speech of June 1963 offered grounds for a later generation to think that a historic opportunity had been lost in Dallas. Hence the nostalgia. For mainstream historians, Oswald’s over-politicized mindset outweighs blaming big war hucksters, the CIA, or the mob for JFK’s death. The Kennedy assassination, claims Paterson, shattered the faith of many Americans in the future. But sustained warfare tends to demoralize populations and shred economies. This observation is as old as Thucydides and as recent as Kevin Phillip’s American Theocracy (2006) and Stein and Lebon’s 1994 effort We All Lost the Cold War. The present Kennedy boomlet comes at a time when too many public figures enamored of “grand expectations” speculate openly about precision bombing a country the size of Iran while sticking it to Russian president Vladimir Putin. In the end, wars rarely do unmitigated good and the Cold War was a war, a point often forgotten even in analyzing Washington’s enormous federal deficits. Sustained war can push unstable elements to the fore. Kennedy’s death as a cautionary tale? Perhaps. 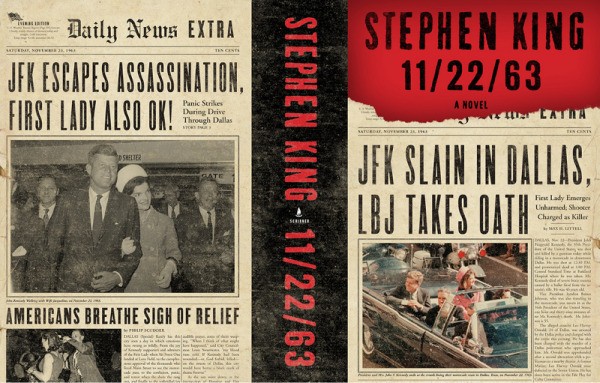 Perhaps Stephen King’s embedded subtext shows why 11/22/63 haunts the culture still.